Growing up in Kooskia, Idaho (population 607), politics and government were the furthest things from my mind. Later on, as a student at the University of Idaho, I focused my studies on chemistry and Spanish and mostly avoided political controversies. But then suddenly, as a young mother, politics happened to me. My newborn son was diagnosed with cystic fibrosis, a rare genetic disease requiring expensive pharmaceuticals, therapies and medical specialists to stay alive. My husband and I quickly realized that politics — like it or not — would be an unavoidable part of our lives. As parents of our extraordinary child, we would be intensely vulnerable to changes in health care policy and insurance coverage. In the decade since, my husband and I volunteered as health care policy advocates. We met repeatedly with lawmakers to discuss crucial coverage programs like Medicaid, and I became national advocacy co-chair for the Cystic Fibrosis Foundation. Over the years, I grew increasingly discouraged by the Idaho Legislature's refusal to expand Medicaid access to the 62,000 Idahoans struggling without health insurance in the "Medicaid gap." Frustration finally compelled me to engage in politics at the grassroots level. 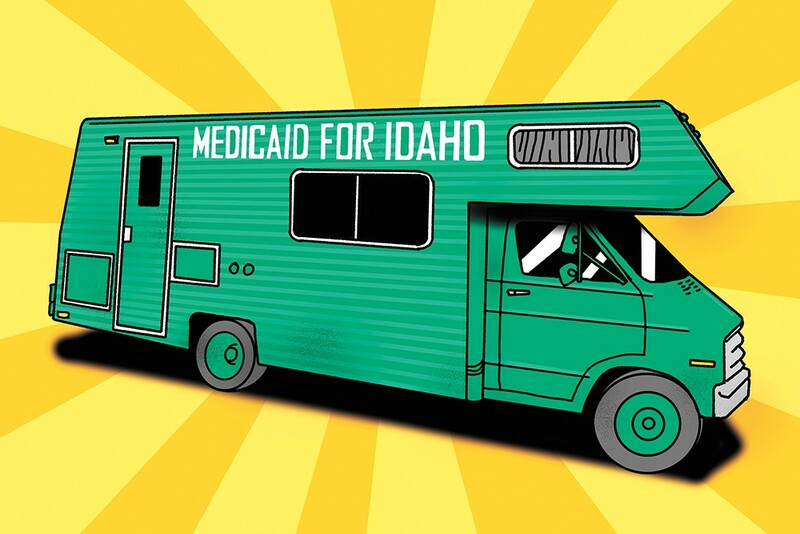 I partnered with Reclaim Idaho, a new organization of grassroots activists who were traveling the state in a bright-green 1977 RV dubbed the "Medicaid Mobile." Together with supporters from every region of Idaho, we worked to build enough community support for a ballot initiative to finally close the Medicaid gap. I was so inspired by the campaign to expand Medicaid that I decided to run for a seat in the Idaho Legislature and to make Medicaid expansion the cornerstone of my platform. As I continued to work with Reclaim Idaho, our grassroots organizing ignited a level of community action rarely seen. Volunteers gathered 75,000 signatures statewide to qualify Proposition 2 for the midterm ballot. Although my bid for a seat in the Legislature was unsuccessful, on election night I joined thousands across the state in celebrating a huge health care victory for the people of Idaho. Medicaid expansion was approved by a landslide. A whopping 61 percent of Idahoans voted yes, including a majority of voters in 35 of Idaho's 44 counties. By ignoring the brutality of the Medicaid gap for so many years, Idaho lawmakers inadvertently helped create a massive network of engaged citizen lawmakers. In my view, the community organizing around Idaho's Medicaid expansion represents the most positive, inspiring story in American politics today. Since the election, I've been reflecting on the other critical issues demanding urgent policy action in Idaho. On the campaign trail, I heard countless heartbreaking stories from people struggling to make ends meet due to Idaho's outdated minimum wage, which is less than half of Idaho's calculated "living wage." Meanwhile, poll after poll demonstrates that Idaho voters are deeply concerned with the issue of K-12 funding. Ever since a major overhaul of our school-financing laws in 2006, funding has become drastically less equal across districts. The shameful result is that an Idaho child's educational opportunity now depends on his or her zip code, with affluent districts receiving far more funding per student than poorer districts. All across the state, underfunded school districts are struggling to recruit and retain talented teachers. Rebecca Schroeder is a lifelong Idahoan, residing in Coeur d'Alene with her husband, Brock, and son, Brady. She is a passionate advocate for health care justice and works as executive director for the grassroots group Reclaim Idaho. The original print version of this article was headlined "How Citizens Make Laws"